A Fortieth-Day Divine Liturgy will be held on Sunday, June 3, 2018 at 11:00 am at Sts. Peter and Paul Melkite Catholic Church, 1161 North River Road. 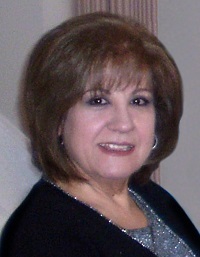 Beloved wife of Joseph Abou-Eid. Much loved mother of Josie (Ali Toghrol) and Andrea (Rommey Dassouki) who will keep her memory alive in Joseph, Julia, Alexander and Adam so they know they were loved by a grandmother they were too young to remember. Dear sister of Elie Mahfouz and Therese (Antoine El Helou), all of Ottawa; George Mahfouz, Mahfouz Mahfouz, Marwan Mahfouz and Marie (late Fares Kassab), all of Lebanon. She will be greatly missed by her many nieces and nephews, as well as her brothers-in-law Bassam Abou-Eid and Georges Abou-Eid and her sister-in-law the late Norma Gedeon. Passed away on Saturday, April 21, 2018. ‘I am alive like you and I am standing beside you. Close your eyes and look around, you will see me in front of you.” Gibran Kahlil Gibran.